Janome 8077 Review - Is this sewing machine any good? Anyone who has ever bought a sewing machine will agree that it requires exhaustive research. Similarly, a detailed comparison of all the models available in the market is needed to find the one that is just right. Right? Well, you can easily find the ideal sewing machine by keeping in mind the kind of sewing that you want to do. At the same time, you should also know the features that your sewing machine must have and your budget. 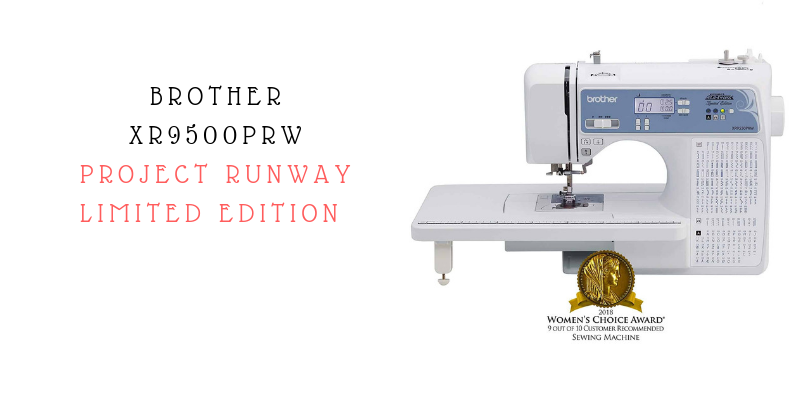 In this article, we are going to do a detailed review of the Brother XR9500PRW Limited Edition Sewing Machine. Let’s find out if this machine is ideal for all sewing levels and if you should buy it. 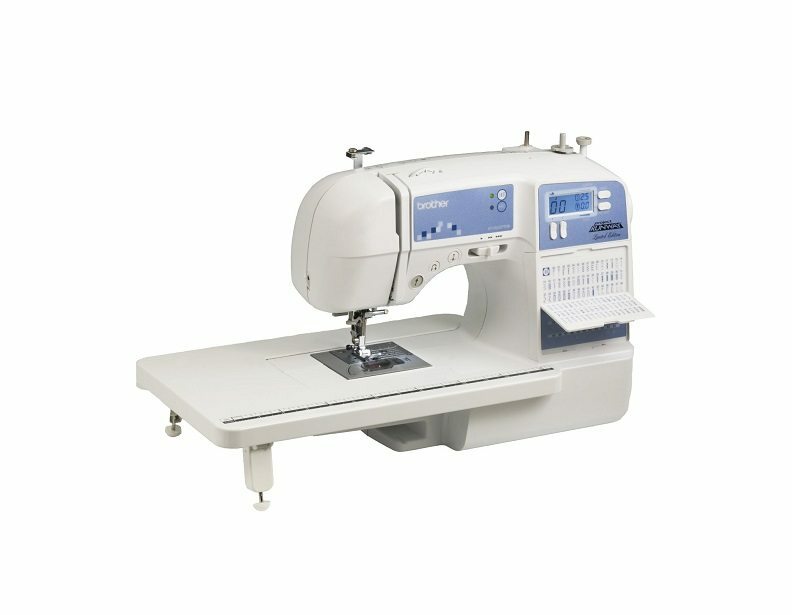 Brother XR9500PRW is a fantastic all-around sewing machine that excels at all sewing projects. It is perfect for beginners as it does not require any assembling. You can use it straight out of the box. On the other hand, experienced seamstresse enjoy its wide range of automatic features, the plethora of automatic buttonholes and built-in stitches. This machine comes with a wide quilting table which helps to complete all your quilting projects without any difficulty. This feature-packed machine helps to embellish clothes and home décor items. 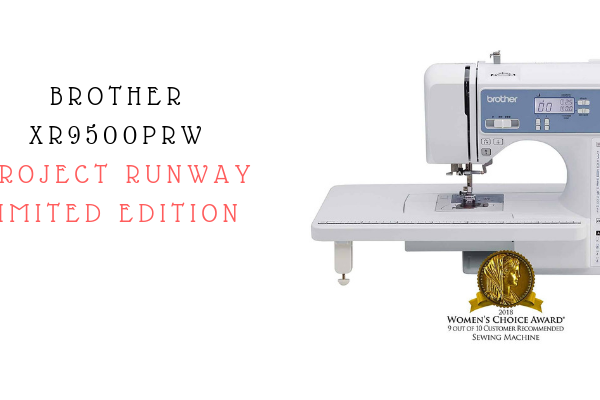 The XR9500PRW Project Runway sewing machine comes with 100 unique, built-in decorative, heirloom and utility stitches. It can create beautiful quilt designs with the help of different stitches. This machine from Brother is a computerized machine with a large back-lit LCD screen that makes stitch selection very easy. The most notable feature when you take this machine out of the box is its size and weight. It weighs only 9.92 lbs. and has dimensions of 11.45 x 6.69 x 16.02 inches. 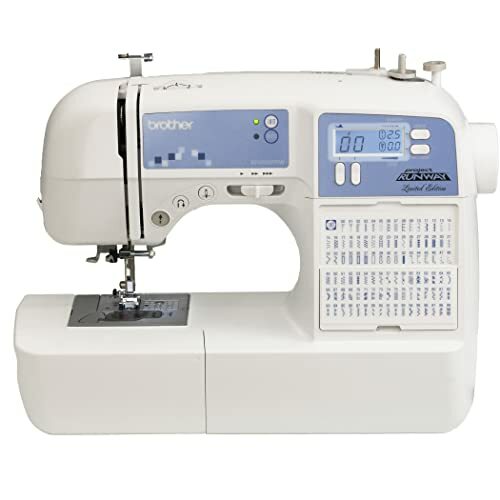 The XR9500PRW is ideal for beginners as they can easily carry it to their sewing classes. This machine comes with a hard case which further increases this machine’s portability. Now let’s talk about this machine’s design. It is one of the most appealing machines from Brother with a bright LCD. The blue panels look very attractive against the white casing. And that’s not all! The iconic Project Runway logo printed on the side of this machine provides a special touch. The body of XR9500PRW is modern and sleek with an intuitive layout. How can this help? It provides the user a definite idea of what button does what. Furthermore, it has a clear stitch diagram that shows how each stitch will look like alongside their corresponding numbers. Overall, it is a well-made machine which has put great emphasis on features and quality. Brother XR9500PRW is a superb sewing machine that has a number of distinctive features. The LCD screen of the XR9500PRW is large thus making it easier to read the numbers, even for sewers with weak eyesight. Many established manufacturers do not put much attention to the quality of the screen. They sometimes add a screen that is small and dim. However, this sewing machine from Brother does not make the same mistake. There are a number of navigation buttons surrounding the screen. So what do these buttons actually do? They allow you to select the stitch that you require and customize them by changing their width and length. The automatic needle threader helps to save time and complete your sewing projects quickly. This feature is great for people who have dexterity limitations in their hands or poor eyesight. Furthermore, the bobbin is jam-resistant and auto-winding thus adding to your pleasant experience. The versatile XR9500PRW offers 100 built-in stitches and 140 stitch functions. There are plenty of fantastic decorative, utility, and heirloom stitches available. Whether you want to stitch clothes or make quilts, this machine will help you fulfill your sewing dreams. The speed control unit and thread sensor allow 850 stitches per minute. These stitches include 55 alphanumeric stitches for basic monogramming or lettering. You can personalize items like towels and bathrobes by using this monogramming function. The best part? This machine is the most cost-effective one that offers a letter font. The stitches can be selected and customized with the help of the LCD display. The machine also recommends which presser foot to use with your selected stitch. Furthermore, both the stitch length and width can be adjusted to customize each stitch. The stitch length and width can be adjusted up to 5 mm and 7 mm respectively thus offering greater versatility. Although a simple addition, a wide table can add value and variety to the machine making it more efficient. You can use the table provided with the Brother XR9500PRW to complete all your quilting projects with ease. You can remove this table when you are sewing cuffs or sleeves and use the available free arm. Furthermore, this table also has a storage compartment where you can store all the accessories provided. Another great feature of Xr9500PRW is its range option for making buttonholes. Not only does it features a 1-step auto-sizing buttonhole it has eight unique designs. This results in further customizing your sewing creations and helps you produce high quality clothes. So how can you set up a buttonhole? It is very easy, and the process needs a buttonhole presser foot which accompanies this machine. It is very simple to align, and the end result is a neat buttonhole. Moreover, you can also purchase additional presser feet if necessary. These are available from Brother at a very economical rate and are compatible with most Brother sewing machines. The extra bobbins and a sturdy screwdriver further enhance convenience and practicability. The XR9500PRW comes with a dust cover that helps to keep the machine clean. However, there is no carrying case with this machine. A carry case is most helpful for people who have to sew in different locations such as a sewing class. One big advantages of this machine is that it is relatively quiet. 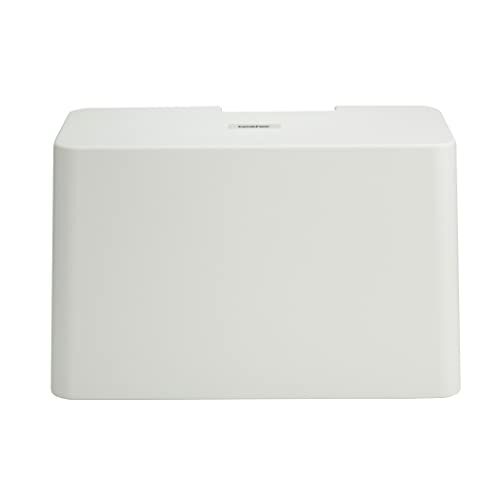 This feature is particularly helpful if there are children sleeping in the house or if your neighbor is fussy. The LED light on this machine is not that bright. This means that supplemental lighting is necessary especially if you are working at night. This machine has a manual thread cutter on the side which is very convenient. The automatic sewing feature helps ensure that the decorative stitches are always perfect. The needle always stops in the down position. How is this helpful? It ensures that you always drop the needle when you raise the presser foot keeping your fabric fixed in the same place while pivoting. The XR9500PRW offers great value and excellent performance at budget-friendly prices. This machine offers many features that are usually available in machines that have a much higher price tag. The stitches are incredibly consistent no matter what the material. Similarly, it performs brilliantly on various materials. The XR9500PR is perfect whether you want to sew a shirt for a party or surprise your grandchildren with a quilt. It doesn’t matter whether you’re a beginner or an experienced seamstress; this quality machine helps to bring your imagination to life. Although being a great sewing machine all around, it may not work very well with heavy materials. While working with denim, the bobbin thread may get stuck a lot. It can sometimes even result in rewinding the bobbin altogether. Furthermore, the monogramming feature puckered badly on cotton. 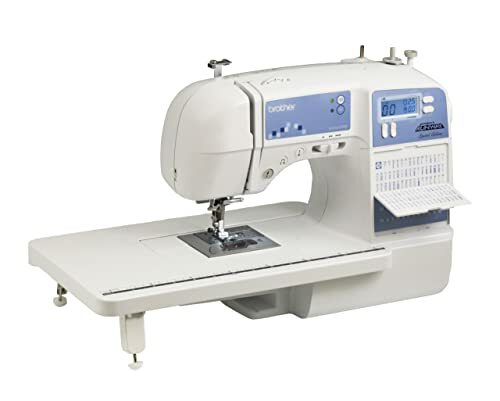 The Brother XR9500PRW is a low-cost, superb sewing machine that performs like any top-of-the-line product. So, you cannot go wrong with this machine. It is a perfect choice for people who are new to sewing and want a machine that can handle different projects. This machine is also great for advanced sewers who are looking for a budget option. It provides them with various options and easy to use features at an affordable price.